Setra's educational webinars and videos on demand provide helpful information on applications, industry best practices and more. 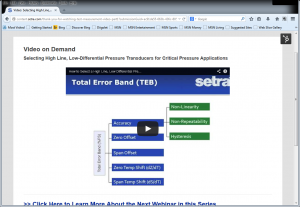 These webinars and videos are just a few of Setra's readily available resources for technical info. This two part webinar series reviews: how differential pressure transducers are used in critical pressure applications, important characteristics of a differential pressure transducer, and what features to consider when selecting a pressure transducer for test and measurement applications. Overpressurizing Pressure Transducers Experiment: In Setra’s engineering lab we put to the test 3 pressure transducers and demonstrate how they handle high overpressure conditions. Current Switch Comparison: This short video compares common current switches & introduces the Sure-Set. CLICK HERE for access to watch Setra's webinars and videos on demand.